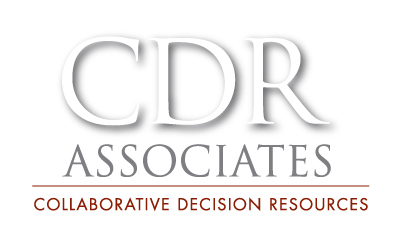 CDR Associates (www.mediate.org) is a collaborative problem solving organization, based in Boulder, Colorado with almost 40 years of experience. Our goal is to make complex projects simpler, find solutions to conflict, and bring diverse groups together to make better decisions. We work in a variety of arenas including transportation and energy projects when federal, state and local authority compete, in the public health arena where stakeholders have diverse needs and in the water arena where water is scarce or in need of coordinated management. We provide facilitation, mediation, stakeholder engagement and training - and support all these services with our commitment to and expertise in collaboration. The binding element of our work is the pursuit of improved environmental and public policy outcomes by bringing together diverse and sometimes conflicting perspectives together. We're looking for a Program Associate to join our team - someone who has good communication and organizational skills and is hardworking, reliable, creative, willing to question convention, and able to handle multitask in a small entrepreneurial organization. As a junior member of our team you'll be assisting with the design and implementation of our services, assist with organizational and office needs, and communication with stakeholders. • Excellent organizational skills with demonstrated ability to execute projects on time and on budget. • Serve as a junior member of facilitation, mediation and training teams. This may include providing flip-chart recording or note-taking, writing meeting summaries, handling logistical tasks, assisting with project management, and/or conducting preparatory interviews. • Assist with proposals and responds to information requests from prospective clients. • Support the development and revision of training materials including: training offerings, curricula, and training evaluation. • Assures the maintenance and organization of relevant project materials and records as needed for planning, evaluation, and monitoring. • Maintain client database and outreach plan to ensure organized project and partner communication. • Research issues and substantive information related to CDR projects, on request from other program staff. • Assist with the management of website content, newsletter and other social media. • General office administration and organization, including office supply inventory and purchasing. Send us a one- to two-page Resume and Cover Letter by January 15, 2018.